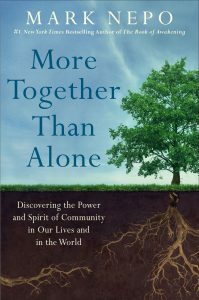 This online community guide is a companion to my book, More Together Than Alone: Discovering the Power and Spirit of Community in Our Lives and in the World (Atria Books, July 2018). After twelve years of research, I have gathered stories and lessons of community from across cultures and history, with the aim of affirming that, despite the hardships always present, we are more together than alone. The result of all this research and listening is a profile of case studies and social experiments that inquire into the dynamics of relationship and community that arise out of how we’re inspired and forced to care for each other. While some moments of community were long-standing and multi-generational, others may have lasted a week or an hour. The focus of this book is to uncover the pathways that bring us together. In the Hindu Upanishads, there’s a passage that speaks to how those who become wise lose their names in the Great Oneness, the way rivers lose their names when they flow into the sea. In this transformation from the solitary to the communal, there’s a mysterious physics that each generation has to relearn regarding what is possible when we can work together. In each generation, we’re asked to discover, through love and suffering, that we are at heart the same. How do we come to this knowledge in our lives, in our families, and in our communities? What brings us together and what throws us apart? How do we inhabit what we have in common as well as what makes us unique in ways that deepen our daily practice of service and compassion? To honor the timeless process that enlivens these questions, this book is focused on moments of community and how they work. Why tend to all this? Because somewhere another child is being born who will ask us things we don’t yet know, and we must have some sense of how to account for our time on Earth. Ours is a complicated era and so we need every resource and example of heart and resilience we can find. It is both comforting and challenging to realize that no one person can wrestle from the Earth the song of how we can survive together and no one voice can sing that chorus. The stories of community in this book help us accept and inhabit the spiritual fact that we need each other more than ever. I encourage you to enter these conversations, activities, and resources with a friend or loved one, and in time, with someone you don’t yet know. For community builds when a kindness is given and a voice is heard, and when something is built together that can’t be built alone. These guidelines support my book, More Together Than Alone: Growing the Roots of Community (Atria Books, July 2018). o I invite you to convene listening and storytelling sessions in order to better understand each other, your backgrounds, experiences, and beliefs. These sessions are separate from action sessions in which you can work together to build or repair aspects of your community. o Gather in a circle when possible in order to validate the need for everyone’s voice and viewpoint. o Agree that no one knows what’s true or real for anyone else. Therefore, you are not gathering to judge each other or give each other advice. More importantly, you are listening your way together toward greater clarity about the community you live in: its strengths, its problems, and its pathways of repair. o Commit to making your meetings safe, open, and honest. Confidentiality in the listening and storytelling sessions is imperative. o Commit to accumulating meaning rather than choosing meaning. The whole of everyone’s views and beliefs is greater than any one person’s view or belief. o Remember that, while action is a natural outcome of these small groups, listening and storytelling are actions by themselves that weave and strengthen the bonds of community. o Remember that, when convening a small group, you commit to exploring the nature of community through being together, asking questions, listening, telling stories, and by exploring pathways of action in the community where you live. o Commit to bringing a question and a story to every meeting. o I invite you to use the “Questions to Live With,” cited below, in the small groups you might convene. o Agree on the next time the group will meet before you leave. I discovered dozens of stories about community while researching my book, More Together Than Alone: Growing the Roots of Community (Atria Books, July 2018). (Amazon link here) Each story in the book offers a lesson about the nature of our bonds as human beings. I offer this page as part of the online community guide (link here) that accompanies the book. It’s a place for you to tell your own stories of community, by sharing examples of when we, as human beings, have worked well together. Whether your stories involve a few other people or hundreds, and whether your stories occurred in one day or across many years, we need to hear them. This open-ended page is also a place to explore and discuss the meaning of community: why we need it, how it helps, and what is missing. Here are two stories from the book as a way to begin. Elie Wiesel recalls the Holocaust death march he and thousands were forced to make in the ice and snow of the eastern European night; forced to run barefoot for hours toward Buchenwald. In anticipation of the Allied forces, the SS butted and pistol-whipped the emaciated prisoners on and on. Anyone who slowed or stopped was trampled. Those who fell were shot. In the midst of this hell, a poor soul near Wiesel stumbled to the hard ground. Others nearby fell on top of him. But why? Because they knew he would be killed? Because without thinking they hoped that the SS wouldn’t know which of them to shoot? Because some in their exhaustion were ready to surrender their broken lives to keep the bullet from ending his life? There was too much chaos in the air. The guards just beat them all till they got to their feet. The second story of unexpected community is more recent. It took place just off the old town square in Santa Fe, New Mexico. One of the oldest bookstores in the city, Collected Works, was moving about three blocks from San Francisco Street to Galisteo. On the day of the move, over a hundred volunteers showed up and formed a line from the old storefront to the new. And one by one, they passed book by book, all day long, until the move was complete. This is a metaphor for how people show up, across time, to help move the stories of the tribe from one living home to another, a book at a time, a person at a time, just off the public square, story by story, hand by hand. At our best, we are stewards of knowledge that everyone needs but which no one owns, passing what matters from seeker to seeker, from generation to generation. I invite you to add to this stream of stories with your own. These questions appear at the end of each section in my book, More Together Than Alone: Growing the Roots of Community (Atria Books, July 2018). (Amazon link here). I offer them as a way to personalize and expand your relationships within your own community. They involve reflection, deep listening, honest conversation, and an encouragement to engage in local action where you live. I invite you to use these questions in the small groups you might convene. And I invite you to use a personal journal as a home for your reflections. • The Dalai Lama has called kindness a religion. Bring four or five friends together. In conversation, have each of you describe an ancestor you admire in the lineage of kindness. In the next three weeks, practice the religion of kindness in one small way, individually and as a group. • In your journal, describe a moment of community you have witnessed or experienced in which hardship or suffering has led people to work together for the common good? What made this moment possible? Bring this conversation to someone you are currently working with, and plan to work together in a specific way for the common good. 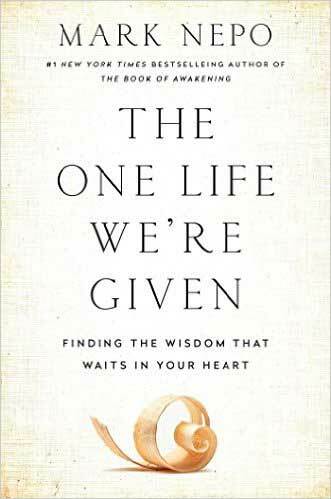 • Our limited or expanded sense of community depends on whether we believe in a world that is not connected or in a world that is inextricably woven together. Bring four or five friends together. In conversation, have each of you tell a story of a time when you felt disconnected from the rest of life and of a time when you felt knit into the fabric of the Universe. 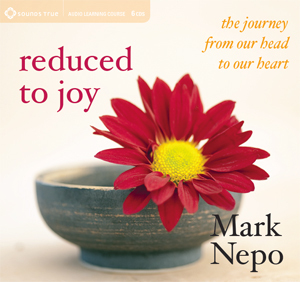 Describe the inner and outer circumstances that lead to feeling disconnected and connected. In the next three weeks, describe one way your immediate community feels disconnected and act on restoring that connection. • “Tikkun Olam” is Hebrew for “You are here to repair the world.” Since we are the world, we are here to repair ourselves. Bring four or five friends together. In conversation, have each of you describe one way you need to repair yourself in order to change the world. What is the first step in this healing? In the next three weeks, commit to taking that first step. • There are two prominent Buddhist traditions: Hinayana and Mahayana Buddhism. Hinayana Buddhism seeks personal enlightenment (Hinayana means little raft), while Mahayana Buddhism seeks a mutual enlightenment with others (Mahayana means big raft). Bring four or five friends together. In conversation, describe what kind of raft each of you is building and why. In the next three weeks, make plans for where and how you can build the next piece of your community raft together. • Bring four or five friends together. In conversation, have each of you describe your personal experience of being ignored by others and your experience of being interdependent with others. As a group, discuss the difference between being ignored and being interdependent. In the next three weeks, identify a practice in your community that is ignoring others and how you might make that practice more interdependent. • Bring four or five friends together. In conversation, have each of you describe one way your family and community support you in being who you are and one way they dissuade you from being who you are. Then, describe one way you support those around you in being who they are and one way you dissuade those around you from being who they are. In the next three weeks, identify a practice in your community that dissuades others from being who they are and how you might support those involved in more thoroughly being themselves. • Bring three friends together and invite two new people into your group. In conversation, have each of you discuss an island in time you have experienced in which two or more people have worked well together, a time when two or more people have brought into being an accomplishment or quality that neither could have brought about alone. As a group, discuss the lesson in these stories and how they can apply to the community you live and work in. • Four sustaining forms of hospitality are: shelter, affirmation, remembering our larger home, and spiritual hospitality (helping another cross a threshold). Bring friends together and invite two new people into your group. In conversation, have each of you discuss a time when you were given one form of shelter. Then explore your readiness to offer some form of shelter to someone in your community. • The thrill of chance serves as a poor substitute for the experience of genuine risk. Chasing thrills rather than facing genuine risk affects how hidden or open a community can be. Bring three friends together and invite two new people into your group. In conversation, have each of you tell the story of a time when you pursued the thrill of chance rather than facing the genuine risk before you. Then describe a genuine risk you are each facing right now and how you might meet it. • Bring three friends together and invite two new people into your group. In conversation, have each of you describe what learning together means to you. How do you practice learning in a daily way? How do you learn from others? And how can you support the power and practice of learning in your family and community? • Bring three friends together and invite two new people into your group. In conversation, have each of you describe a time when you discovered that you were more together than alone. Then discuss if your community is working well together. Finally, identify a need you can address in your community that will bring people together. • Bring three friends together and invite two new people into your group. In conversation, have each of you describe your own struggle with scarcity and abundance. Tell the story of a time when you lived in fear that there wouldn’t be enough, and tell the story of a time when you felt certain that there would be enough. As a group, discuss if your community operates out of a sense of scarcity or abundance, or a mix of both. Then, identify what you can give to an area of scarcity in your community. • Bring three friends together and invite two new people into your group. In conversation, have each of you describe one gift you inherently have to offer the world. Then, as a group, explore how you might extend and combine your gifts to make a difference. • We are capable of great creativity and great cruelty. Each of us can build libraries and each of us can burn books. Bring four or five friends together. In conversation, have each of you describe a time when you built something and a time when you broke something. What led you to be creative and what led you to be destructive? In the next three weeks, bring this conversation about creativity and cruelty to another part of your community. • Go on a journey with a friend or loved one to visit a museum. Be open to what you discover there. When moved by a piece in the museum, linger long enough to hear it speak. Then find a quiet space in which to discuss the experience with your friend or loved one. In the next three weeks, make an effort to bring someone else in your community to this museum. • Frederick Olmstead, the landscape architect who designed and built Central Park in New York City, envisioned common meeting grounds, where people would come upon each other after walking in solitude. Set out with a friend or loved one to arrive at a common meeting ground after you each experience a period of solitude. Once there, listen to each other’s experience and concerns. Then determine how your experience of solitude affected your experience of community. In the next three weeks, identify a common meeting ground in your community and contribute to it. • The notion of “the commons” refers to land which no one owns but which everyone benefits from and cares for. “The commons” can also refer to common resources, common stories, common truth, or a common tradition or wisdom. Bring four or five friends together. In conversation, have each of you tell the story of a form of “commons” that you benefit from and how you might contribute to its care. • Living well together involves moving through our blindnesses, while getting things out of each other’s way. Bring four or five friends together. In conversation, have each of you describe a blindness you are encountering in yourself or with those you live with or work with. Then, describe one thing you need to get out of each other’s way. In the next three weeks, invite the people involved in your stories to describe these elements from their own point of view. Follow up by having a working conversation about how you might remove the things in each other’s way. • Bring four or five friends together. In the spirit of Iroquois dream-walkers, have each of you share a dream. After discussing how each dream speaks to the dreamer’s life, explore the dreams together for how they may speak to the dream and needs of your larger community. In the next three weeks, take a step in your community toward implementing one aspect of what your dreams point to. • Bring four or five friends together. In conversation, have each of you tell the story of someone who has been a mentor to you. What did they teach you? Are you passing this learning on? How? In the next three weeks, tell the story of your mentor to someone else in your community and ask them to describe a mentor who helped shape them. • Bring three friends together and invite two new people into your group. In conversation, have each of you describe a time when you turned from being a caregiver to being a gatekeeper. How did this happen? What did you learn from this experience? In the next three weeks, identify a caregiver and a gatekeeper in your community and begin a conversation with each. • Bring three friends together and invite two new people into your group. As a group, discuss the notion of an acequia and how it is cleared each spring of all its debris so the mountain water can feed the village. Then, have each of you describe the debris of thought and feeling you carry and how you might go about clearing the acequia of your mind and heart. In the next three weeks, identify an acequia or common channel in your community that needs communal clearing, and begin the process. • Bring three friends together and invite two new people into your group. In conversation, have each of you tell the story of a time when you insisted on your own view and where that insistence led. Then tell the story of a time when you withheld your judgment and welcomed a view other than your own. Where did that openness lead? In the next three weeks, convene a community conversation on an issue important to you with those who hold an opposite view from you, and see if you can understand each other. • Bring three friends together and invite two new people into your group. In conversation, have each of you tell the story of one way you are self-centered and one way you are other-centered. How does being self-centered and other-centered affect your relationships? What might you do to expand your circle of viewpoint and concern? In the next three weeks, make an effort to inquire into someone else’s life. • Bring three friends together and invite two new people into your group. In conversation, have each of you tell the story of a time when you were shut out and a story of a time when you were taken in. Where did you learn about how to meet the misfortune of others? In the next three weeks, take a step to let someone you don’t know into your life. • Bring three friends together and invite two new people into your group. In conversation, have each of you tell the story of someone you know whose prime way in the world is to conquer and possess. Compare this person to someone you know whose prime way in the world is to discover and understand. How are these people different? Which way of knowing is prominent in you? Discuss the kind of community you live in. • Bring three friends together and invite two new people into your group. In conversation, have each of you tell the story of something you created or built with another person and what this process felt like. How did this co-creation affect your relationship? What would you say to a child about the nature of building things together? In the next three weeks, work with another to create, build, or repair something in your community. • Bring four or five friends together. In conversation, have each of you describe someone you admire for how they face adversity. What can you learn from them about how to work with what you’re given? In the next three weeks, help someone discover their own way of meeting adversity. Encourage each person in your small group to convene a similar group on their own to explore the same questions. • Bring four or five friends together. In conversation, have each of you describe something you have worked on and cared about that you had to build again. How did you face this? How did you do it? What did you learn from this experience? In the next three weeks, identify something in your community that needs to be built again. Encourage each person in your small group to convene a similar group on their own to explore the same questions. • Bring four or five friends together. In conversation, have each of you describe what you might say to a child about the nature of hardship and obstacles, their role in our lives, and how to best meet them. In the next three weeks, begin to work with a hardship or obstacle that has been difficult for you and your community. Encourage each person in your small group to convene a similar group on their own to explore the same questions. • Bring four or five friends together. In conversation, have each of you tell the story of a time when you were moved to help another person though you didn’t know them well. What made you get involved and help? Was it a life-giving or life-draining experience? Will you get involved again? In the next three weeks, be open to helping a stranger. Encourage each person in your small group to convene a similar group on their own to explore the same questions. • Bring four or five friends together. In conversation, have each of you describe a value or pattern of inherited behavior that you’re struggling to free yourself from. Why do you want to change this? What kind of resistance are you facing? In the next three weeks, identify one pattern of inherited behavior in your community that needs to change and convene a conversation about this. Encourage each person in your small group to convene a similar group on their own to explore the same questions. • When faced with fear, we have these impulses: to fight, to go numb and compliant, or to leave. Bring four or five friends together. In conversation, have each of you describe a time when you experienced each impulse and where each led you. Without judgment, how do you value these impulses and what would you like to learn next in how to face fear? In the next three weeks, identify a place of fear in your community and begin a conversation on how you and others might face it. Encourage each person in your small group to convene a similar group on their own to explore the same questions. • Bring four or five friends together. In conversation, have each of you explore what it means to you to reclaim your humanity. Describe a situation in which you felt that you lost some of your humanity and how you went about repairing who you are and becoming whole again. In the next three weeks, support a project in your community that supports the reclaiming of our humanity. Encourage each person in your small group to convene a similar group on their own to explore the same questions. • The Native American from Seattle, Martina Whelsula, was given a bundle of sacred objects as a child and told to be kind and gentle wherever she went. Bring three friends together and invite two new people into your group. In conversation, have each of you name three things in your sacred bundle that help you stay kind and gentle. How can you pass them on? In the next three weeks, make an attempt to be kind and gentle to others in your community. Encourage each person in your small group to convene a similar group on their own to explore the same questions. • In 1871, the leaders of the Commune of Paris dropped leaflets from hot air balloons across the countryside, which read: “Our interests are the same.” Bring three friends together and invite two new people into your group. In conversation, have each of you identify a common interest that is life giving, as well as a common problem you are facing. In the next three weeks, explore two ways you can work together in your engagement of both. Encourage each person in your small group to convene a similar group on their own to explore the same questions. • Bring three friends together and invite two new people into your group. In conversation, have each of you describe how you are affected by the epidemic of violence in our society today. Are there ways you are violent in your daily life? How can you stop being violent? In the next three weeks, take a step toward stopping the epidemic of violence in your community. Encourage each person in your small group to convene a similar group on their own to explore the same questions. • Bring three friends together and invite two new people into your group. In conversation, have each of you describe your experience of self-interest and serving the common good. How does your self-interest show up in your days? And how does serving the common good affect your relationships? In the next three weeks, identify one place in your community that serves the common good and support it. Encourage each person in your small group to convene a similar group on their own to explore the same questions. • Bring three friends together and invite two new people into your group. In conversation, have each of you tell the story of a time when the courage of another opened you beyond your own assumptions and conclusions? In the next three weeks, do one thing in your community that will make it more inclusive. Encourage each person in your small group to convene a similar group on their own to explore the same questions. • Bring three friends together and invite two new people into your group. In conversation, have each of you tell the story of an experience of love that expanded your intelligence. In the next three weeks, do something loving in your community. Encourage each person in your small group to convene a similar group on their own to explore the same questions. • Bring three friends together and invite two new people into your group. In conversation, have each of you describe one way that family, friends, or community have helped to deepen your empathy. In the next three weeks, do one thing to expand the presence of compassion in your community. Encourage each person in your small group to convene a similar group on their own to explore the same questions. This reading and film list supports my book, More Together Than Alone: Growing the Roots of Community (Atria Books, July 2018). • Awakening Earth: Exploring the Evolution of Human Culture and Consciousness, Duane Elgin. William Morrow and Co. Inc., New York, 1993. • Better Together: Restoring the American Community, Robert D. Putnam and Lewis M. Feldstein with Don Cohen. NY: Simon & Schuster, 2003. • Birth of a Global Community: Appreciative Inquiry in Action, Charles Gibbs and Sally Mahe. Lakeshore Publishers, 2004. • Bowling Alone: The Collapse and Revival of American Community, Robert D. Putnam. NY: Simon & Schuster, 2000. • Where Do We Go from Here: Chaos or Community, Martin Luther King, Jr. MA: Beacon Press, 1968. • Community and Growth, Jean Vanier. NJ: Paulist Press, 2nd Revised edition, 1989. • Confucius: The Secular as Sacred, Herbert Fingarette. NY: Harper & Row, 1972. • The Connect Effect: Building Strong Personal, Professional and Virtual Networks, Michael Dulworth. Berrett Koehler Publishers, Inc., San Francisco, 2008. • Cosmic Consciousness: A Study in the Evolution of the Human Mind, Bucke M.D. and Richard Maurice. The Citadel Press, New Jersey, 1961. • Cultivating Communities of Practice, Etienne Wenger, Richard McDermott and William H. Snyder. Harvard Business School Publishing. Boston, MA, 2002. • Defiant Gardens: Making Gardens in Wartime, Kenneth I. Helphand. TX: Trinity University Press, 2008. • Dr. Elkhanan Elkes of the Kovno Ghetto: A Son’s Holocaust Memoir, Joel Elkes. MA: Paraclete Press, 1999. • The Earth is the Lord’s: The Inner World of the Jew in Eastern Europe, Abraham Heschel. Woodstock, VT: Jewish Lights Publishing, 2001. • The Expansion of Consciousness, Ralph Metzner. Berkeley, CA: Green Earth Foundation and Regent Press, 2008. • The Great Transformation, Karen Armstrong. NY: Alfred A. Knopf, 2006. • The Guide for the Perplexed, Maimonides. A mix of Jewish thought and Sufi mysticism, and Islamic mystics. • Heart: A Personal Journey Through Its Myths and Meanings, Gail Godwin. NY: William Morrow, 2001. • Homage to Catalonia, George Orwell. Benediction Classics, 2010. • Honeybee Democracy, Thomas D. Seeley. Princeton, NJ: Princeton University Press, 2010. • Humanity and Self-Cultivation: Essays in Confucian Thought, Tu Wei-ming. Berkeley, CA: Asian Humanities Press, 1979. “The Importance of ‘Reculturing,’” Scott Thompson. Education Week. March 1, 2006. 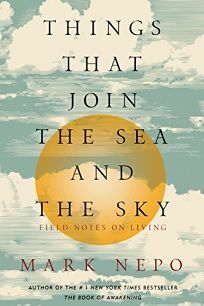 • In the Vale of Soul Making: A Dialogue, Matthew Fox and Rupert Sheldrake. www.resurgence.org/resurgence/articles/fox.htm , August, 2005. • The Journey from Knowing about Community to Knowing Community, Sally Z. Hare, March 2005. • Leadership and the New Science: Learning about Organization from an Orderly Universe, Margaret J. Wheatley. San Francisco, CA: Berrett-Kohler Publishers, 1994. • Left to Tell: Discovering God Amidst the Rwanda Holocaust. Immaculee Ilbagiza (with Steve Erwin). Carlsbad, CA: Hay House, Inc. 2006. • The Lev Tov (Good Heart). A book of Jewish custom and ritual regarding community. • Life in a Crowded Place: Making a Learning Community. Ralph Peterson. NY: Heinemann, 1992. • Life Together, Dietrich Bonhoeffer. NY: HarperCollins, 1954. • Man’s Search for Meaning, Viktor Frankl. MA: Beacon Press, 2006. • The Medici Effect: Breakthrough Insights at the Intersection of Ideas, Concepts & Cultures, Frans Johansson. Boston: Harvard Business School Press, 2004. • Mind in Society, L. S. Vygotsky. Edited by M. Cole, V. John-Steiner, S. Scribner, and E. Soubermna. Cambridge, Mass: Harvard University Press, 1978. • The Moral Imagination: The Art and Soul of Building Peace, John Paul Lederach. NY: Oxford University Press, 2010. • The Ornament of the World: How Muslims, Jews and Christians Created a Culture of Tolerance in Medieval Spain, Maria Rosa Menocal. MA: Back Bay Books, 2003. • The Power of Collective Wisdom: And the Trap of Collective Folly, Alan Briskin , Sheryl Erickson , John Ott , Tom Callanan. San Francisco, CA: Berrett-Koehler, 2009. • Rights and the Common Good: The Communitarian Perspective, Amitai Etzioni. NY: St. Martin’s Press, 1995. • Spiritual Ecology: The Cry of the Earth, edited by Llewellyn Vaughan-Lee. CA: The Golden Sufi Center, 2013. • Surviving the Holocaust: The Kovno Ghetto Diary, Avraham Tory, edited by Sir Martin Gilbert. Boston: Harvard University Press, 1990. • Teaching Community: A Pedagogy of Hope, bell hooks. NY: Routledge, 2003. • “Thirteen Ways of Looking at Community (…with a fourteenth thrown in for free),” The Inner Edge, Parker J. Palmer, 1991. “Using Emergence to Take Social Innovations to Scale,” Margaret Wheatley and Deborah Frieze. http://www.margaretwheatley.com/articles/emergence.html. 2006. • War and the Soul: Healing Our Nation’s Veterans from Post-Traumatic Stress Disorder, Ed Tick. Wheaton, IL: Quest Books, 2006. • What’s Going on in There? : How the Brain and Mind Develop in the First Five Years of Life, Lise Eliot. NY: Bantam, 2000. • What Is Life?, Lynn Margulis and Dorion Sagan. NY: Simon & Schuster, 1995. • The Wisdom of Crowds, James Surowiecki. NY: Doubleday, 2004. • Following Sean (2006). This documentary by writer-director Ralph Arlyck begins with a conversation with four-year-old Sean Farrell, the son of free-spirited parents living in 1969 in San Francisco’s Haight-Ashbury neighborhood. Arlyck revisits Sean and his parents thirty years later, reflecting on his own life journey along the way. • Frederick Law Olmsted: Designing America. A film by Lawrence Hott and Diane Garey. An excellent PBS documentary on Olmsted’s struggles and genius. • Grace is Gone. Director James C. Strouse tells the story of an ex-military man trying to find the courage to break the devastating news to his two daughters that their mother has died while serving in Iraq. The film won the Dramatic Audience Award at Sundance 2007. • Grave of the Dragonflies. Named Best Animated Feature at the 1994 Chicago International Children’s Film Festival, this 1986 film by director Isao Takahata is a compassionate tale of orphans Seita and Setsuko as they struggle for survival in post-World War II Japan. • John Adams. The PBS mini-series based on the book by the Pulitzer-Prize winning historian David McCullough. • The Koyaanisqatsi Trilogy, Godfrey Reggio. This is a landmark film trilogy. The first film is (1982) which is Hopi for life out of balance. The second film Powaqqatsi (1988) combines two notions, powaq (sorcerer) and qatsi (life). It refers to a way of life that consumes the life force of other beings in order to further its own life. The third film is Naqoyqatsi (2006) which is Hopi for a life of killing each other. • The National Parks: America’s Best Idea (2009). Legendary filmmaker Ken Burns’ unfolding of this extraordinary part of America’s history. Viewing anything by Ken Burns is helpful in understanding the evolving community that is America. • The Pianist, Roman Polanski (2002). This remarkable film is an adaptation of the autobiography of Wladyslaw Szpilman, a famous Polish Jewish pianist working for Warsaw radio, who sees his whole world collapse with the outbreak of World War II and the invasion of Poland in September 1939. The story chronicles his life in hiding and his eventual witness of the Warsaw Ghetto Uprising of 1943. • Shakespeare Behind Bars, Hank Rogerson. A documentary film portraying the prison-theater company, Shakespeare Behind Bars, founded by Curt Tofteland.